Plaintain Fry or Balekayi fry is one of the simpliest, quickest and absolutely delicious Indian recipe. Plaintain in kannada is called Balekayi. Cooking time is also very very less so its my favorite vegetarian side dish. Just a few handy ingredients to start preparing this yummy dish. So why wait, lets head straight to the recipe. 1. Peel the plaintain, cut it into thin slices and keep aside if you are using it right away else just immerse it in water so it doesnot change color. Its better to rub a tsp of oil on your palms and then start peeling and slicing the plaintains in order to keep our hands stain free. 2. 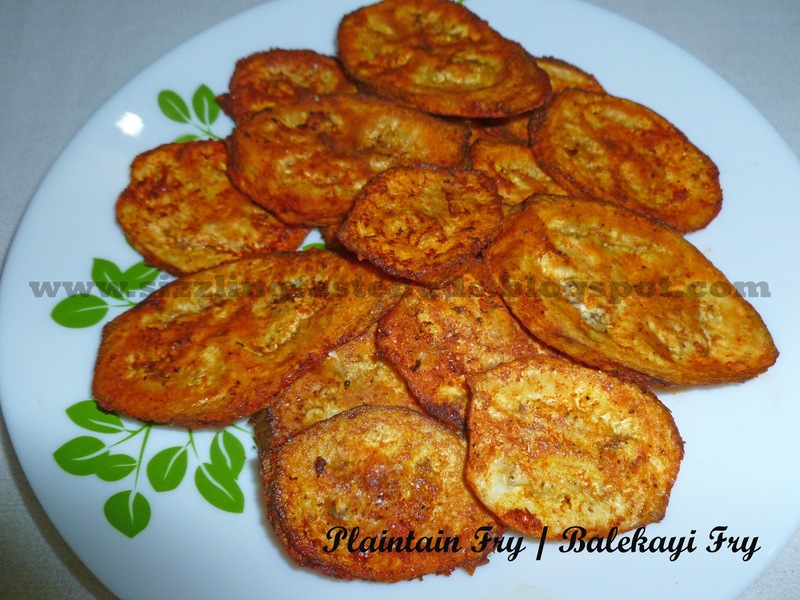 Make a paste of all the dry ingredients mentioned above and apply it to plaintain slices. 3. Heat a tsp or two on a frying pan and place the slices on it. Cover it with a lid to reduce the cooking time. After few mins turn the slices and cook the other end. 4. Serve hot with rice and sambar, curd rice.